Eight or nine years ago my depression hit an all-time high—by which I mean low. It’s hard to imagine being more depressed and staying alive. 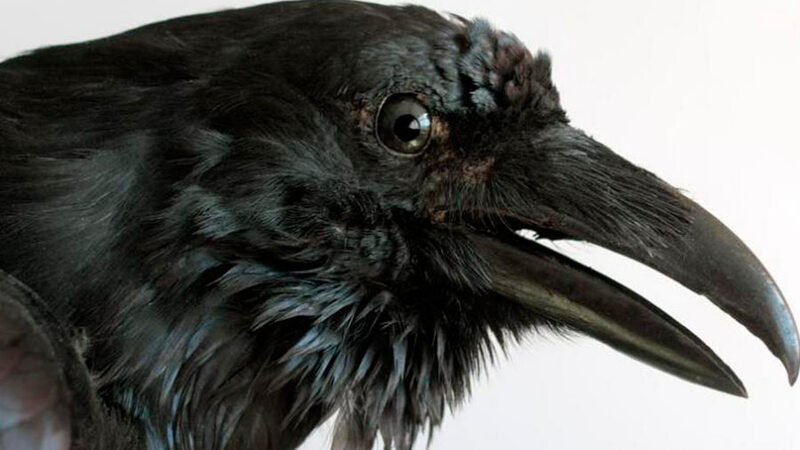 I consider it a personal privilege, an act of faith, when friends share their own intense encounters with “the feathered thing”. Some have bottomed out, as I had—or hoped it was a place where we couldn’t sink lower. I found myself driving around town more or less aimlessly, considering how to save myself: a phone call connected me with a professional who does triage, and that brief process set an appointment with someone I came to know as Doctor Bob. Forty years of intermittent counseling had gone badly for me; mental health was no closer than it had been in high school but I vowed this time would be different. Was there, I puzzled, something common to all those failed therapies? The answer was simple and surprising, given the circumstances: I’d entered each therapist’s office wanting to be liked and comported myself accordingly, which meant each of those several professional relationships was doomed before it began. Not so this time. The Brooklyn edge in Dr Bob’s voice was a good sign; I wasn’t from here either. But it was Wallace Shawn’s double who welcomed me to the inner office, and seven years later it was a friend who bid me farewell—another surprise. In the meantime, change was an exercise in watching time pass — on a calendar, not a clock. Incremental change was imperceptible; I was different each time, but didn’t know how and couldn’t say why. And though Dr Bob (not his real name, by the way) has retired, the process he set in motion continues. I’ve not opened all the gifts received during our time together; who knows what the greatest of them will be. The gift I currently enjoy is memory: mine is considerably improved over the days when my only concern was acceptance. Surprising how many folks will accept you when you accept yourself and are free to enjoy what’s going on all around. Some day Howard will get around to writing about “lake culture” that developed at Sturm und Drang in the late 19th century. Until then, I’m gathering images to build the character of the place: shoreline views like this one, boat docks, the resorts themselves, and other attendant structures predating the 1950s. 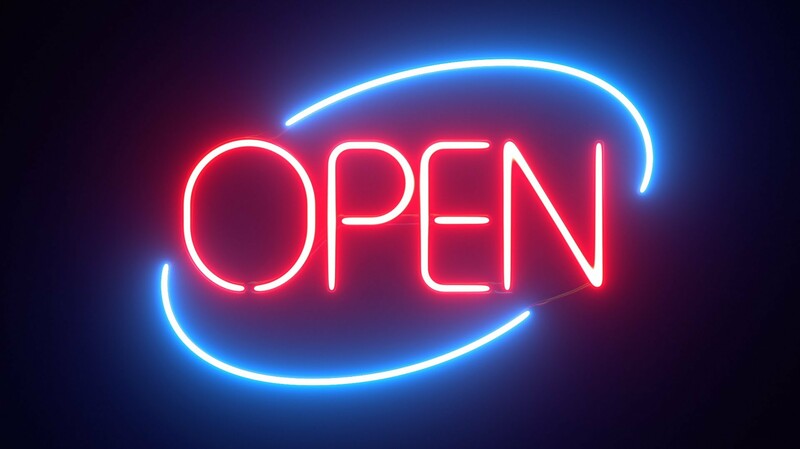 If you have some to offer, or know of stories describing lazy summer weekends or (my favorite) those other seasons when no one was around, please share. Until then, I’ll continue to outline the story Howard will eventually tell us. In the meantime…. Spring fed, yet there is so much anger beneath its surface that Sturm und Drang is reluctant to freeze. Long before Europeans saw the Muskrat Valley, abundant hunting and fishing made Sturm und Drang — folks hereabouts are inclined to refer to the linked lakes as “it” — a watering hole and campsite for the indigenous people, possibly even before the Sac & Fox were here. Our own settlers used Sturm und Drang that way, as a dietary supplement, before the railroad improved both the quantity and the quality of food. But when was it recognized as a place of recreation? How did the earliest White settlers “recreate”? Would they have understood the word as we do? By the 1870s, S&D yielded ice for refrigeration — the old ice house has become a cabin near the Station-Store (de facto city hall for the dispersed community called “Resort”) — and by the 1880s other purpose-built cabins gathered along the eastern and southern shores. Clusters of those became resorts, and by 1890 Smith’s Hotel opened to guests. 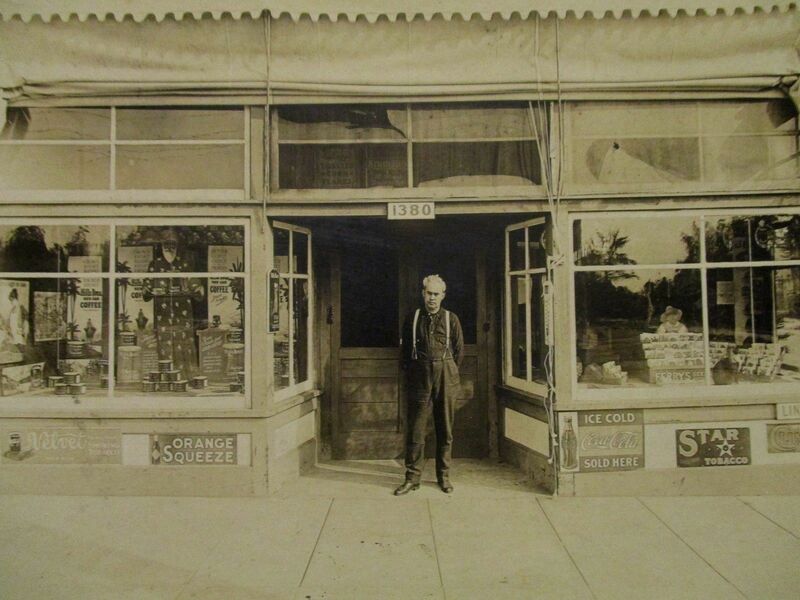 The Store — more evidence of our penchant to identify things with a single, generic, capitalized name — became the sourse of supply for basic foodstuffs, bread baked by the proprietor Edith Prikleigh, and whole milk from a nearby farm; produce varied with the season. Edith served as postmaster (she disliked the feminized version, postmistress) and by 1900 her son Ivor delivered mail by motorboat. When the interurban branch came in 1910, Ivor piloted a water taxi coördinated with arrival and departure of the trolley. 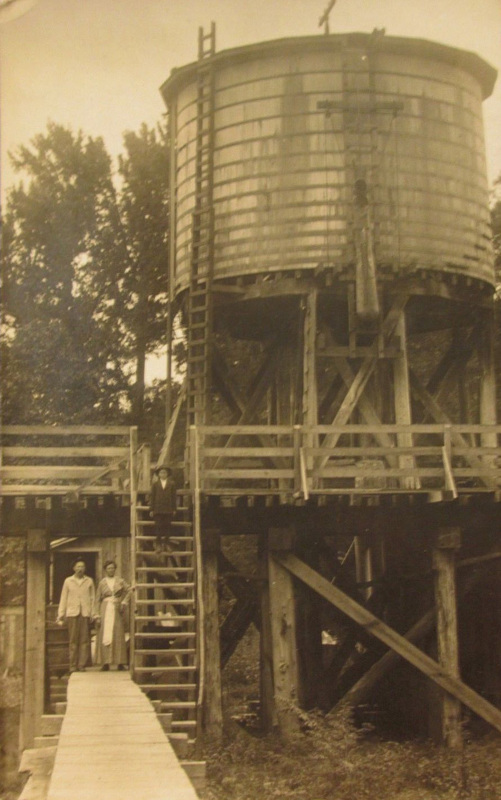 If you thought a weekend at the lake exempted you from church attendance, think again: a rotation of pastors (Baptist, Methodist, Episcopal, and Roman) served a union chapel converted from a chicken coop, which came to be called Saint Ferreolus. 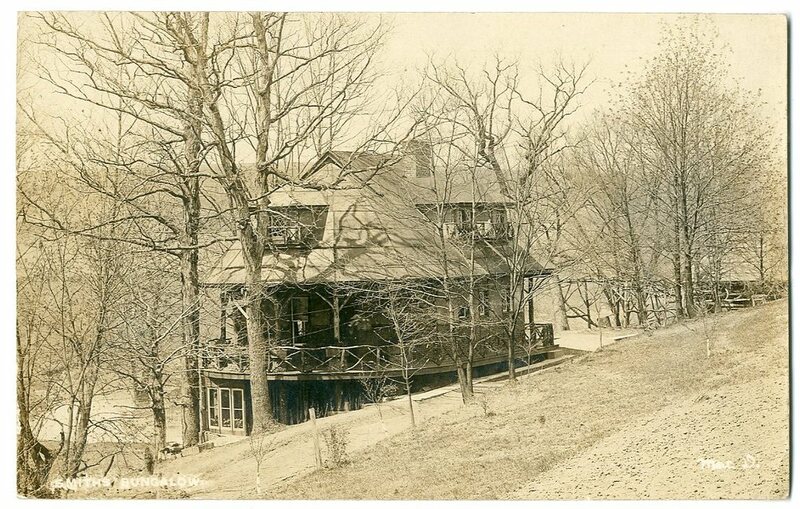 With its school-bell call to Sunday service the Edwardian palette of lake life was set through the 1920s. 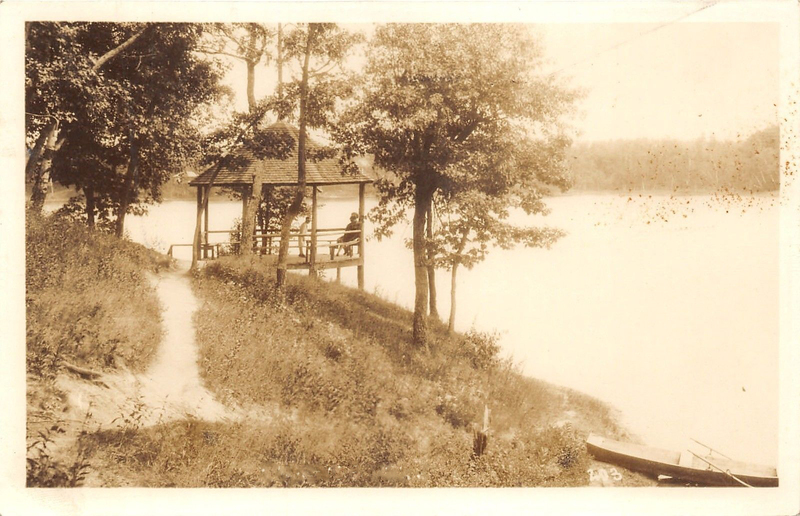 And after WWII that rhythm was preserved by The Association (of lake property owners) who regulated lake life with one simple provision: a speed limit on boat traffic of 10 m.p.h. No water skiing or other aquatic hijinx here, thank you, very much. This remains a place where the front porch is “the Green room” and bourbon or beer the beverages of choice; where the only cable is a stitch used to knit; and all calls are on hold. Viennese artist Theodor Klotz-Dürrenbach is poorly represented in auction sale catalogues, though he seems to have created both woodcuts and paintings. 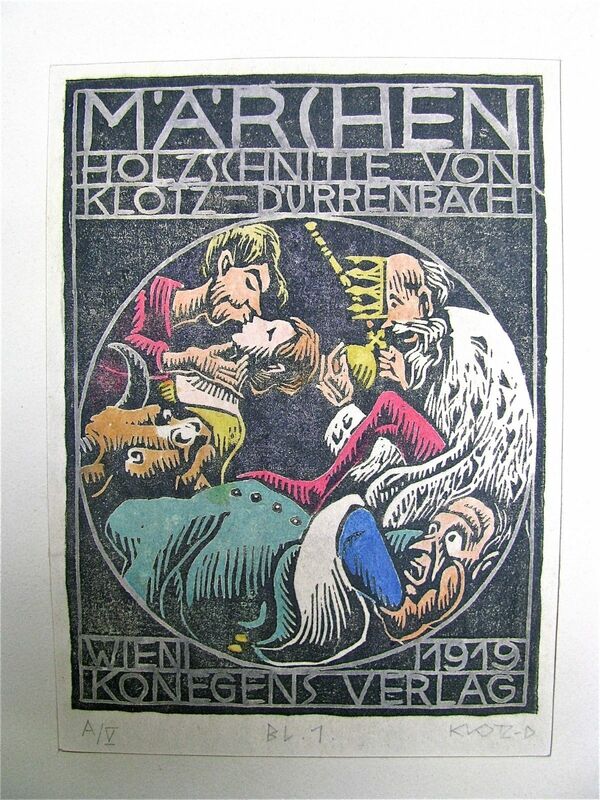 This poster for a Viennese exhibit of fairytale-based woodcuts (märchen holzschnitte) was printed in 1919. The print is accompanied in the collection by a book illustrated by the same artist—Russische Volksmärchen by Eugen Weller, published in 1925—which includes four full-page woodcut illustrations by Klotz-Dürrenbach. Both print and illustrated book came from the personal library of Dr Reinhold Kölb, founder of the Walden Clinic. Though untitled, the print tells us about itself—”Fairytale Woodcuts by Klotz-Dürrenbach”—and indirectly about the circumstances of its presence in the Kölb library: the good doctor famously used the fabrication of fairy tales in his innovative drama-therapy and public shows of puppetry. 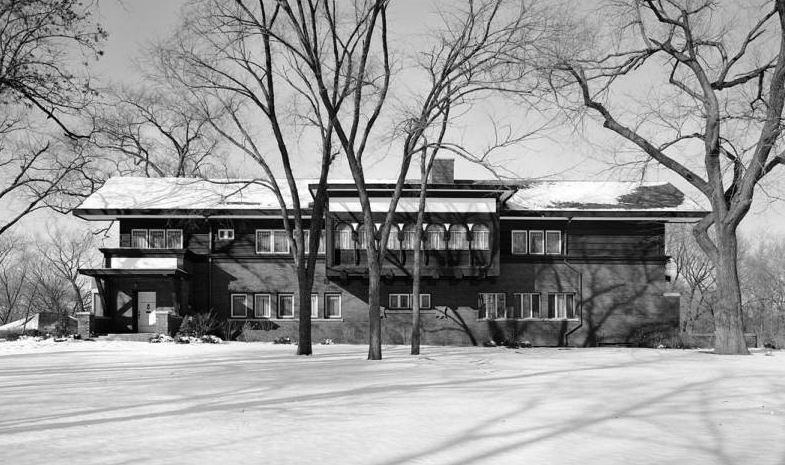 I thought that Louis H. Sullivan had designed three houses during his post-1900 career—the years following dissolution of his partnership with Dankmar Adler; the period when his chemical dependency had interrupted an otherwise brilliant and uniquely American design process—two of which were built; another was merely projected. It turns out there were six other projects worth looking at during about the same years. As evidence for an imaginary library in the style of Sullivan, they form part of the analytical matrix. 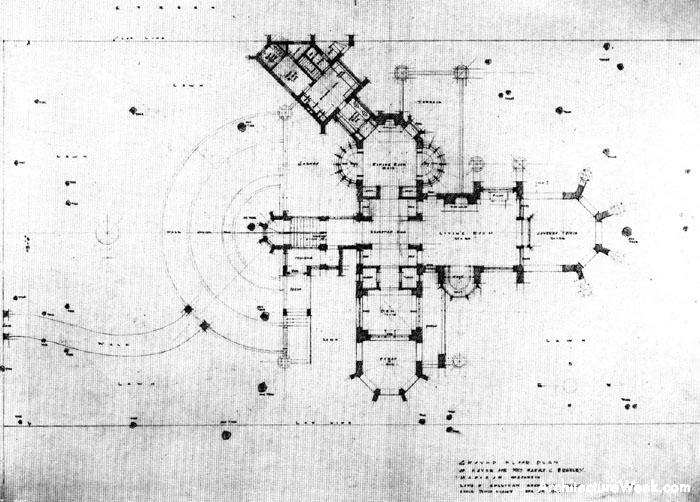 Harold and Josephine Crane Bradley house (scheme #1), Madison, WI (unbuilt); Louis Sullivan architect, assisted by G.G. Elmslie. Design and construction extended from 1909 to about 1913. But the Bradleys lived in the house for only a few years, moving to another house designed by Elmslie alone. The second of the built designs was roughly contemporary with the Madison project. It was a comparably-sized house in Riverside, a leafy western suburb of Chicago, for Henry Babson, a far more likely client for Sullivan. 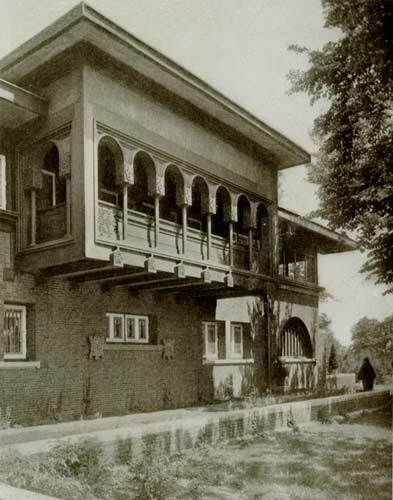 Babson is called “an American entrepreneur, investor in phonograph technology, and notable breeder of Arabian horses” in one biography, placing him in a better financial position for the expense of a custom-designed house by LHS. Like the executed Bradley scheme, the Babson house is a long ship-like form, a linear sequence of rooms pulsing along a single extended axis. The balcony extension along the street elevation gave the house a steamboat quality that might have made it the brunt of neighborhood humor. It was demolished in 1960 and the property subdivided for multiple mid-century homes or no particular character whatsoever. I have vague recollection of walking past the site when I was a teenager. All three of these design have a few characteristics in common: long rectilinear masses, two stories in height; secondary cross-axial extensions, often with polygonal pinwheel elements at the extremities; and an extended axial arrangement of main floor social spaces. 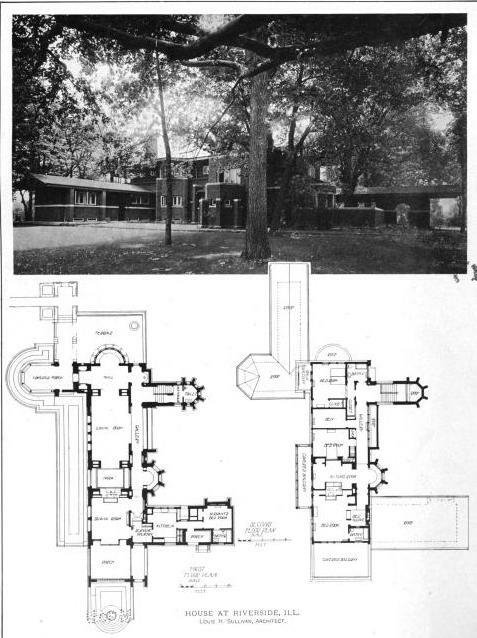 Given that the three designs date from the period 1908-1912, we’re given a lot of insight to Sullivan’s mind, at least regarding the detached single-family home, at this late point in his career. While I was in high school my dad subscribed to the Wall Street Journal. Having a lot of time on his hands at the gas station, he dabbled in mutual funds; unlike most people who simply invest in them and sit back to enjoy the return on their investment, Roy chose to buy and sell, making a few cents profit here and there. It was then that I learned a bit about the market from dad’s broker Mr William A. Simmons, an immaculately tailored older gentleman—in three-piece tweed suits even in August and never looking the least bit uncomfortable—who hung out at the station even after he’d retired from the brokerage business. I was privileged to call him Willie but was never comfortable with that familiarity. Requirements: Age 18 to 50. Be able to read, write, keep simple accounts, sail a boat, perform manual labor and have enough mechanical skills to maintain the equipment and do minor repairs. May leave the station only to draw pay or attend public worship. Cause for Dismissal: Intoxication or failure to keep the lights burning, regardless of circumstances. Duties: Daily and monthly routines for cleaning, maintaining and repairing all equipment. Lamp is lighted at sunset, extinguished at sunrise and watched continuously through the night. Keep a daily log of the light, the passage of ships in the area, the weather and the consumption of supplies, particularly lamp oil. Extra money: Encouraged to garden, make shoes, tailor, fish or serve as preacher or schoolteacher, if close to the lighthouse. Mail service: Usually once a month. What, you may ask, do the duties of a lighthouse keeper have to do with Agincourt? Good question. 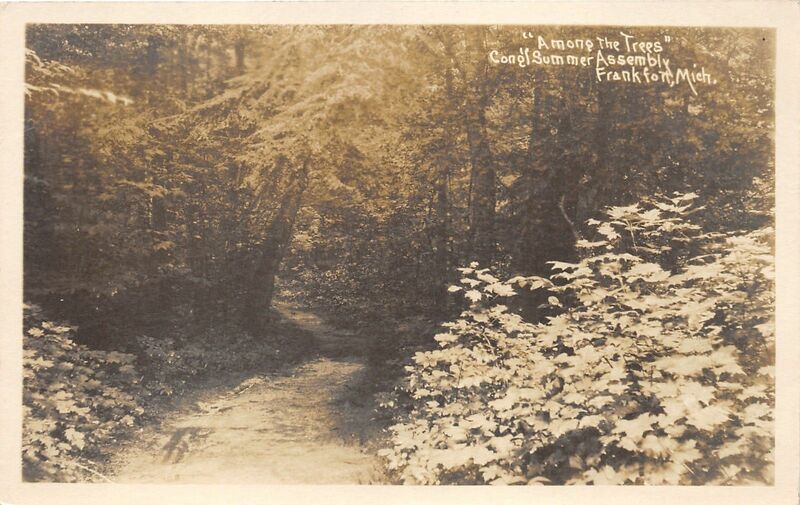 The postcard above reminded me of that splendid isolation I’d sought in 1960. Perhaps my back-up should have been “Watertower Keeper”? My first visit to Castle Drogo happened in the 80s. You may be more familiar with Lindisfarne, Sir Edwin Lutyens other “castle” on the opposite end of England. Drogo—not the Dothraki warlord from “Game of Thrones”!—is in Devon, a county southeast of Greater London and the site for, among other things, Conan Doyle’s “Hound of the Baskervilles”. The house itself is attached to the village of Drewsteignton, or is it the other way around, for the house may actually occupy more square meterage than the village. In both cases I recommend a visit to Drogo and Lindisfarne be added to your bucket lists. Both houses are dramatically sited, one grafted to a rock outcrop on Holy Island in the North Sea, the other precarious on the edge of the Teigne River gorge. What I recall about my visit to Drogo was its likeness to a pilgrimage: train from London to Exeter (where you should see the cathedral), then a bus into the countryside, where the driver will cheerily deposit you at a country crossroad and bruskly wave you on to a rendezvous with Dorothy, Toto and their other traveling companions. As rendered by Monty Python, of course. If anyone other than the local wildlife had heard me, I’d have been hastily returned to the care facility from whence I’d escaped. If there’s an expeditious way to reach Castle Drogo, please keep it to yourselves, for this was the stuff of a five-minute movie. 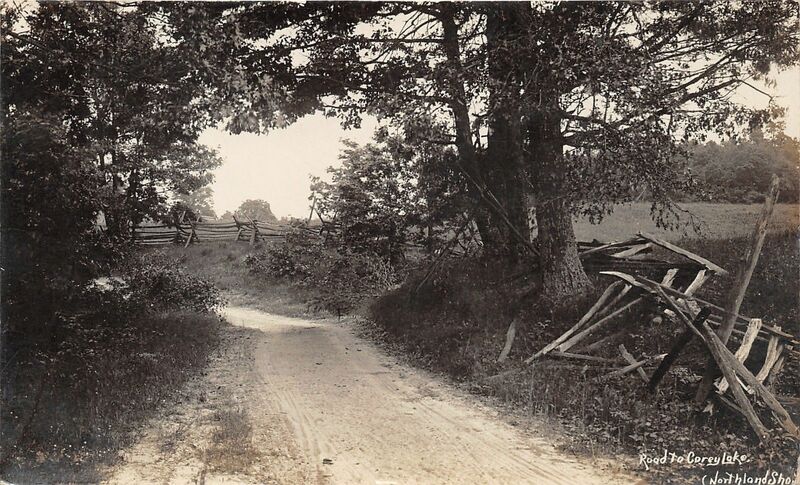 Though the hedgerows and underbrush weren’t thick, like they are in these postcards, their solitary stillness took me back to that day in June and reminded me how a walk through the countryside around Agincourt might evoke a similar reaction—a step back to an afternoon in June thirty-five years ago and to a summer day a century before that.